The ICOM IC-A25NE is the latest development in airband radio technology featuring built-in Bluetooth, GPS and significant VOR navigation functions. Free Transair Cockpit Bag worth £34.00 with every ICOM handheld Transceiver! The simplified waypoint NAV guides you to a destination by using current position information from GPS (also GLONASS and SBAS). The waypoint NAV has two functions: Direct-To NAV and Flight Plan NAV. Up to 10 flight plans and 300 waypoints can be memorized in the IC-A25NE. The CDI (Course Deviation Indicatoris detailed like a real VOR instrument, and displays any deviation from your course. The OBS(Omni Bearing Selector) enables you to change course from the original flight plan. The TO-FROM indicator shows the position relationship between your aircraft and the course selected by the OBS. The ABSS (Automatic Bearing Set System) function enables you to set the current course as a new course in two simple steps. The near station search function assists you in accessing nearby ground stations. The function searches for nearby stations using the station memories that have GPS position information. To use the near station search function, position data and frequencies of the ground stations must be programmed. 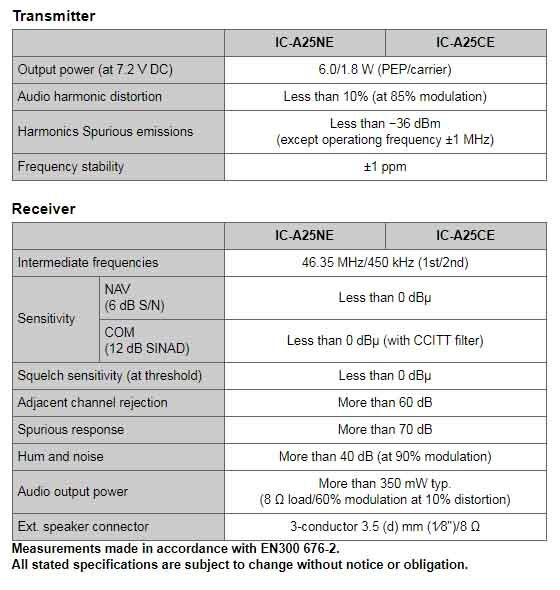 For expanded communication coverage, output power has been increased to approximately 6 W typical (PEP) 1.8 W (carrier) compared to the IC-A24E (5/1.5 W (PEP/carrier)). Easy-to-use Interface Often used functions are assigned to the ten-key pad and you can directly access the desired function. The enlarged flat sheet keypad offers smooth and swift operation. The large, high contrast and highly visible LCD display user-friendly, graphic screens and ensures good readability under sunlight. The operating frequency in large characters can be recognized at a glance. Also, the night mode option allows for easy viewing in low light conditions. 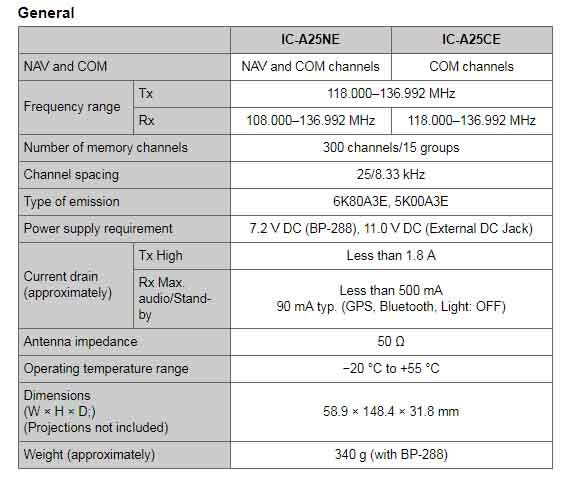 The IC-A25NE stores the last ten channels used. You can easily recall those channels by using the directional keys or the channel knob or the keypad. This is convenient for switching between several channels, such as NAV and COM channels. You can also freely edit (replace, delete, and change order) the stored recall channels). A third-party wireless Bluetooth headset (for example: 3MTM Peltor WS 5 series*) provides convenient hands-free operation. Also, by using the optional VS-3 Bluetooth headset, the sidetone function can be used.